Rejuvenate Herbal tea 750g (1month supply) Buy Button Below. Equine Rejuvenation Through Herbal Tea. Targeted areas- Gut, Coat, Hoof, Joints, Nervous system, Heart, lymphatic system. This is what the Equine Herbalist uses for her Horses, rejuvenate is an herbal tea that Rachel Kelly Equine Herbalist has specifically blended for horses. it is bursting with super antioxidants thus promoting health and wellness. The herbs have been lovingly selected by Rachel Kelly Equine Herbalist, the selected herbs will nourish and support the equine body. Natural antioxidants found in the herbs will provide protection, comfort, relief, nutrition, longevity and above all will help restore balance back to the systems of the equine body to keep your horse in great condition. Soaking your feed using herbal tea will increase the bulk of the feed three fold, and six times in the case of beet. Big feeds take longer to eat and horses need to spend more time eating. Soaking your feed using herbal tea restores natural hydration of forages and encourages your horse to maintain good hydration. Certain herbs in my herbal tea formula are targeted for the gut, the pleasant taste and the soothing effect will maintain excellent gut function. Instead of using water to soak feed why not take advantage of the abundance of antioxidants found in my herbal tea formula and add an antioxidant boost to your horse’s diet. Soaked feeds using my herbal tea will help you achieve a calm and relaxed horse, the herbal blend will help invigorate the body & strengthen the immune system. Herbal teas are convenient to use for your horse the steeping of the herbs in water draws out the extraordinary botanical elements. Herbal teas are one of the most appropriate & purest ways to prepare herbs for your horse. There are no added ingredients that you don’t know about. Take for instance some premade herbal liquid products they contain synthetic vitamins & minerals, alcohol, sugar substances, animal products and a limited amount of herbal extract. Herbal teas are simple, effective and inexpensive. They can be used warm during the winter to help heat your horses feed. If you don’t want to use soaked feed, this herbal tea can be added to drinking troughs. I have been treating horses with herbs & wholefoods for many years now and I have come to understand what the horse’s requirements are. I have been using my rejuvenate herbal tea to help balance and restore harmony in the horse’s digestive system, immune system, nervous system and to create over all protection, helping owners move from maintenance to rejuvenation by restoring health and vitality. For best results make up the night before or let steep for a minimum of 4 hours. Use 25g of dried herbs into a class jar, cover the dried herbs with boiling water, put a lid on the jar and let it steep. 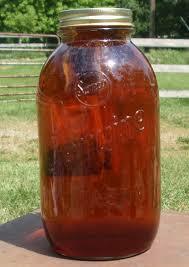 The ideal container to use to steep your herbal tea is an old glass jam/sauce jar with lid. The next morning strain your herbs out and use the rejuvenate liquid to dampen down feed. So simple but yet so effective. juvenation tea on a daily basis. I only use 100% human grade herbs. No fillers or substandard herbal products used. €45 including post and packaging to Ireland, UK and Europe- proceed to buy now button to buy. ingredients- Peppermint, Rosehips, Fenugreek, Dandelion, Vervain, Nettle, Hawthorn berry.